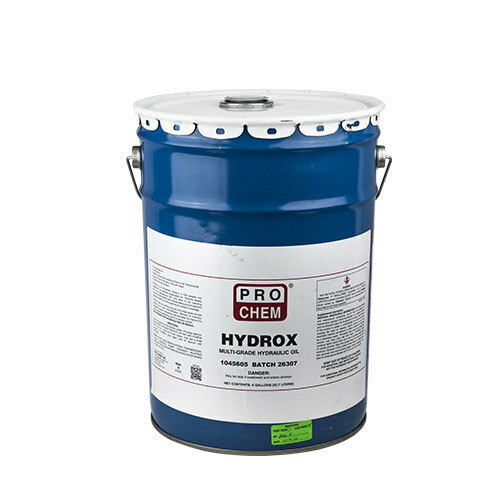 HYDROX | Pro Chem, Inc.
HYDROX is a multi-viscosity hydraulic oil that is specifically designed for maximum service time and performance. It functions over a wide range of temperatures and operating conditions. It is made from high quality, high viscosity paraffinic petroleum base oils which is then improved with the following additives: anticorrosion, antifoam, anti-wear, anti-rust agents along with oxidation inhibitors, pour depressants and non-emulsifiers. HYDROX’s very high viscosity index assures excellent hydraulic operation in winter and summer, because there is less change in the fluidity of the oil from hot to cold. Also, using HYDROX will avoid the need to change from winter to summer grades and eliminate the need to stock more than one hydraulic oil for different types of equipment. This product is appropriate for use as a lubricant with no possibility of food contact in official establishments operating under the Federal meat, poultry, shell egg grading and egg products inspection programs. This compound may be used on equipment where there is no possible contact between edible products and lubricants or lubricated parts. Drain old hydraulic oil from hydraulic system. Fill empty reservoir with HYDROX. FOR BEST RESULTS, DO NOT MIX HYDROX WITH OLD OIL. Drain old oil from system, flush with a small amount of HYDROX, drain again, then fill reservoir with HYDROX.